We has two songs for it today, songs about Smeagol, for Story Saturday! 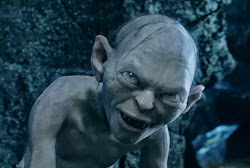 The itssy bitssy Smeagol went up the Mordor wall. Out came the orcs who made poor Smeagol fall. So we tricked the nasty hobbits to meet our friend up there! Hehehehe! We don't like it where you are. Tell the Wraiths our hiding place! Bagginses isn't the only one who can make songs! We came up the these all ourselfs! We are very proud of them. Your writing skill to sound like Sméagol never ceases to amaze me! Those songs are better than the originals, god job Sméagol, someone needs to sing them. Yes, yes, they are much better! We have been practicing, yes, practicing. Smeagol has gotten good at singing them! We think that we should sing them for the credits of the next Hobbit movie, yes? Yes and we know it! Smeagol is pleased! We know the Fat Hobbit doesn't like our songs. But it does!